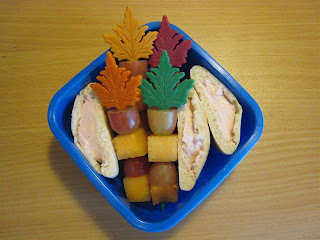 Ben had the aforementioned fruit kebabs on leaf picks (alternating canteloupe and seedless red grapes) and mini flat bread stuffed with strawberry cream cheese. He was supposed to have 4 halves, but I accidently ripped on trying to open the pocket, so he ate that at home topped with the cream cheese instead of stuffed with it. He's easy to please. Love the fall leaf picks. I love the fall leaf picks, too. Where did you find them? The fall picks, I think are cupcake picks from Wilton. They were actually decorations from a teacher appreciation lunch last year and one of the moms I knew saved them for me (she loves me, so she didn't even laugh when I told her why). The containers are a combination of Ebay and the oriental grocery stores around here, but you really could use just about any resealable container to start. The holders are Wilton silicone cupcake liners. I bought a 2 packs when Faith started Kindergarten and still have all of them 2 years later.